Want a great deal on a great yarn? Check out our Calder special! We got a deal on giant, 10 ounce skeins of this wonderful sportweight SuperWash merino, and we are passing that deal on to you. Just one skein will make a child size sweater or baby blanket. Two to three for an adult. This special us only available until these skeins are gone, so hop on over to Abstractfiber.com and grab some up for yourself! 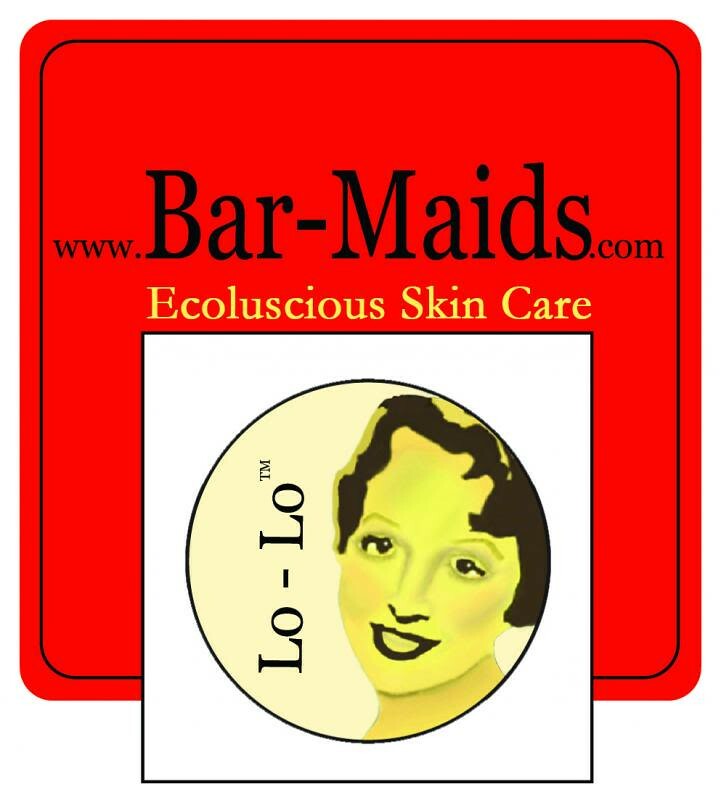 Bar-Maids eco-luscious moisturizers are handcrafted in the USA. Based on family recipes handed down to Kismet Andrews, founder of Bar-Maids, by her grandmother, the locally-sourced and skin-loving ingredients moisturize and hydrate, leaving skin feeling soft and smooth. Easy to apply, convenient to stash, did you know that Bar-Maids travels worldwide without threat of confiscation by TSA? Whether your skin is thick or thin, treat it well. Do as Grandma says, "Get your Lo-Lo on!" Gigi finished knitting the Fluoromania socks out of Regia. Jasmin washed and wore her now finished SPAKAL 2012 sweater. Gigi is puzzled why the Dr. Watson sweater is progressing slowly. Jasmin is working on Wonderful Wallaby by Cottage Creations. for the matchy-matchy KAL. She mentions the Ape Index. Gigi has been working on the Loops and Threads sock and discovered that it had 10% cashmere. Jasmin is working on tube socks for Genevieve, out of My First Regia from Nordic Mart. She ordered more from Love Knitting.com. Jasmin mentions Erica64. We talk about Therbligs, and we promised a definition. For #operationsockdrawer, Jasmin has finished knitting her Dark Side of the Moon socks by Fab Funky Fibres. For Finishing Friday, Gigi finished two preemie hats, and for one of them she used a leaf pattern from Knitting on the Edge , by Nicky Epstein. The Knit Wits are back, check them out! Brenda Dayne has released a new episode of Cast On. And: Stricktanz, a new podcast in German. Jasmin has finished her SPAKAL sweater and insists on wearing it. This week we anwer a couple of questions out of the "What do you want to hear about?" thread about knots. Jasmin discovered her yarn for the Wallaby was from different dye lots. She mentioned the excellent customer service she got at Uncommon Threads. The tiny tube socks for Genevieve are different colors sets. We mention the 10 year warranty on Regia yarn. Gigi has brought home lots of homework from her Spin U class at Purlescence and this week is spinning up 7oz of fiber to spin thick and thin, and 16 wpi. We have been sewing. Jasmin spent one afternoon cutting and is now sewing summer dresses for Genevieve. She is very pleased with the service her machine got at Ray's Sewing. Gigi is working on a dress and is doing a lot of stay stitching. She doesn't want to use a disappearing pen on fabric with silk content, so she will do thread marking. Good grief! That sweet, sweet, adorable little girl voice, and that sweet, sweet mama voice at story time were so stinking cute! What a little doll that Genevieve is, and how beautifully you read to her. Good job, mom!